When little Annie gets sick one night, she has no choice but to stay at home while her family has fun at the theater. It seems that Annie will have to spend a boring evening with Grandpa until he unexpectedly begins to tell her a fairy tale about Pawnie, a young girl who lives in the faraway Chess Kingdom. Does the inexperienced Pawnie have what it takes to succeed in this incredible adventure and make her dream of becoming a princess come true? 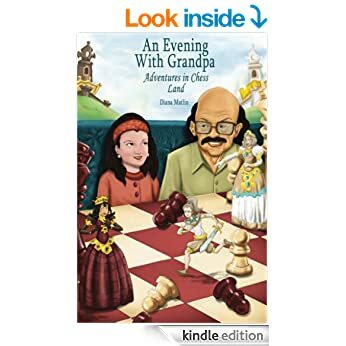 An award winning story, “An Evening With Grandpa”, will take a young reader on a journey through the fairy tale which will blend the magic of chess with a special night for Annie and her grandfather. The book is recommended for ages 5-10 and is designed to introduce a game of chess to children within an action-filled engaging fairy tale. Kids who play chess already will enjoy recognizing the game elements woven into the story.